Between June 29th and July 24th, over 90 students (ages 9-18) participated in one of three summer camps geared to prepare them for our fall production of Joseph and the Amazing Technicolor Dreamcoat. Sound crazy? Read on! When the Playhouse produced Joseph back in the early '90s, then-guest music director Jim Boggess and guest choreographer Kathy Wheeldon traveled to local elementary schools during the school year to work with the participating choirs over the course of several months. This time, however, working during the school year wasn't an option due to the early fall opening of the show. That's when the Playhouse turned to the First Stage Theatre Academy and Joseph Bootcamp. Over the course of each camp, students learned music and choreography which would be used in the fall production. Camp staff members Roxanne Nielsen, Jim Boggess, Vincent Carlson-Brown, Becky Noble, and Julie Andresen definitely put them through their paces! So, what happens between July 24th and opening night on September 25th? Students are required to attend at least three out of five "brush-up" rehearsals in order review all of the material, in addition to practicing on their own. Each student has signed up for one of three groups which will perform twice a week throughout the run of the show. That's three groups of 30+ students, onstage two times a week for five weeks! The Playhouse is thrilled to welcome these enthusiastic students back to the building - break a leg, kids! It's a rainy day here in Omaha but the sun is shining brightly inside the Playhouse! After three very full performances on the opening weekend of Quilters, the decision has been made to extend the production for four additional performances. Originally scheduled to close on Sunday, September 27, the production will now close on Sunday, October 4, at a 2pm matinee performance. We are overjoyed to kick off our 85th Anniversary Season with a show like Quilters. It is an incredibly moving production and has been lovingly embraced by the local quilting community. From the sponsors of the production to the making of the quilts for the show and the coordination of the beautiful lobby display, the input, guidance and support of these guilds has been awe-inspiring! As a community theatre, this production models why we exist and how the performing arts can impact people's lives. If you are in or near Omaha, we hope you can experience this production. If you do, we'd love to see your comments here on our blog and/or on our facebook page. The Omaha Community Playhouse would like to recognize our “Producing Partners” for the upcoming 85th Anniversary productions. These generous donors help defray some of the costs associated with mounting a production, such as costumes, scenery/sets, special effects and more! Sponsored by: HDR and Peter Kiewit Sons’, Inc. Please join us in thanking these generous donors. Their support is pivotal to the success of the Omaha Community Playhouse! The musical drama Quilters will open the Omaha Playhouse’s exciting 85th Season on Friday, August 21st. It has been twenty years since it was first seen on the Howard Drew Theatre stage in the spring of 1987. Back then, I was cast as one of the 9 women in the show and thus began a long and loving association with this theatre piece and the many amazing people and experiences that surround it. Quilters was so successful in its first Playhouse run that the show was remounted for a second year in 1988. 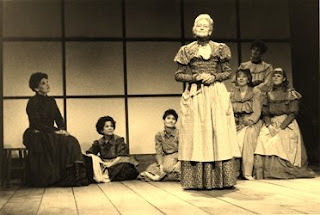 In the spring of 1989, our production of Quilters was chosen to go on tour for three weeks to the Soviet Union as part of a cultural exchange with the Studio Theatre of Moscow and the Omaha Community Playhouse. This tour took place at a time when the words Glasnost and Perestroika held great promise for economic and political reform in the Soviet Union and, as a result, our adventures there were all at once frightening, wonderful, poignant and euphoric. My treasured memories of the sights, sounds, smells and tastes, as well as the people we encountered on that unique journey, are forever with me, as are my dear Quilters “sisters,” with whom I shared the stage. My grandmother’s patterns is in this quilt, and my mama’s…my aunt’s, my daughters’, my sisters, my friends’ and many more. They’re all here and so’s this great prairie that we all lived on. Why is Quilters so popular? Written by Barabara Damashek and Molly Newman, Quilters was created from the stories, journals, letters, and memories of pioneer women and their descendants. It is a celebration of the women who lived, worked, struggled, cried, rejoiced and loved on this great prairie. The various stories of the play are enacted by the character of Sarah and her eight Daughters, who present these funny, somber, poignant and true stories through scenes, songs, and dances. Each story is introduced in the play by an appropriately named quilt pattern, such as Rocky Road to Kansas, Babies Blocks, Dugout, Schoolhouse, Log Cabin, Crosses and Losses, etc. With each pattern, the play honors and celebrates the art of quilting itself and what that necessary craft meant to those women who sought to create something beautiful within their difficult lives. Carolyn Rutherford Mayo, former Playhouse Staff Member and then Managing Director of the Nebraska Theatre Caravan, served as the fine director of that first Playhouse production. You’ll see Carolyn’s hand in our 2009 production from time to time…so much of her staging seems so right to me that I can’t help but attempt to recreate some of it! We are also very fortunate to have the Playhouse’s original Quilters choreographer on board with this 2009 production and I couldn’t be happier about that! Kathy Wheeldon’s lively and innovative choreography so informed that first production and continues to do so now in our current rehearsals. Completing our production team this season is former Omaha Playhouse Music Director, John Bennett, who is already finding the beauty of this lively and haunting musical score. The Nebraska State Quilt Guild was in its infancy in 1987. Its first president, Judie Zinn, became involved with Quilters as curator of a quilt exhibit for our Owen Lobby during the run of the play. Later, Judie travelled to the Soviet Union with the Playhouse cast and crew, in order to demonstrate the art of quilting in the theatre lobbies before and after the play. This season, Judie serves as our Quilting Advisor, teaching the actresses themselves a little bit about this revered craft of hand piecing and quilting, an art form in which Judie greatly excels. Over the last 20 years, Quilting experienced a huge revival all over the country and certainly in our area! 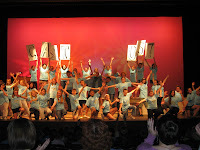 The Playhouse received financial support for this production from both the Omaha Quilters Guild http://omahaquiltersguild.org/ and the Cottonwood Quilters of Elkhorn http://www.cottonwoodquilters.org/. In addition, approximately 30 quilters from these guilds created the 17 quilts that will be featured in the play, under the guidance of Jan Fry, our outstanding Production Quilt Director. Thanks to Jan, these beautiful quilts have already been completed and are currently enhancing and informing our rehearsals. In addition to these 17 quilts, the Playhouse is planning a Quilt Exhibit in the Owen Lobby during the run of Quilters entitled Pieces of Our Lives. Nancy Kirk of The Kirk Collection and Teri Quinn, who also serves with her husband Ron as Sponsors of Quilters, will curate the exhibit with the assistance of Francie Conrad. The exhibit will feature both contemporary quilts by local quilters and antique quilts chosen from the Kirk Collection. Thanks to Jan Fry, playgoers will be able to see live quilting demonstrations during the run of the show and will be encouraged to take a few stitches themselves! The memorable finale of Quilters consists of the revelation of Sarah’s last quilt, which she calls her Legacy Quilt. Our production will feature a 12’9” by 12’9” Legacy Quilt that incorporates each of the show’s 17 quilt patterns in its design! This remarkable quilt was designed by Peg Pennell, an internationally award winning quilt designer from Ashland, NE. We are so excited that Peg’s amazing work will be featured both in our production as well as in our Lobby exhibit. Check out Peg’s website at http://www.pegpennell.com/, if you want to see what contemporary quilting can be! If you make careful plans, it will come out right. This beautiful show isn’t just for quilters. It isn’t just for women. It speaks, sings and moves to the rhythm of the prairie through the rallied voices of our female ancestors -their faith, their hardships and their joys. Their stories belong to all of us. Please come and experience Quilters.